When it comes to eyeshadow, I pretty much stick to what I know. It’ll most likely be something bronze all over the lid with something matte and warm in the socket line and then brown liner smudged everywhere (like I mentioned here) and a liquid liner flick (like I mentioned here). Nothing groundbreaking, and one of the criteria I look for in eyeshadow is that it can be done whilst I drink tea and watch Netflix in the morning. I’m a multi-tasker, OK? I suppose my main point though is that eyeshadow is easy. I am not claiming to be an expert, and I’m sure people might be horrified when they see how sometimes it’s not blended enough or it’s too smudgy but whatever. I’m wearing gold on my eyelids, cut me some slack. The best bit about eyeshadow is that one you have the right tools, you’re good to go. They do the work for you. They really do. 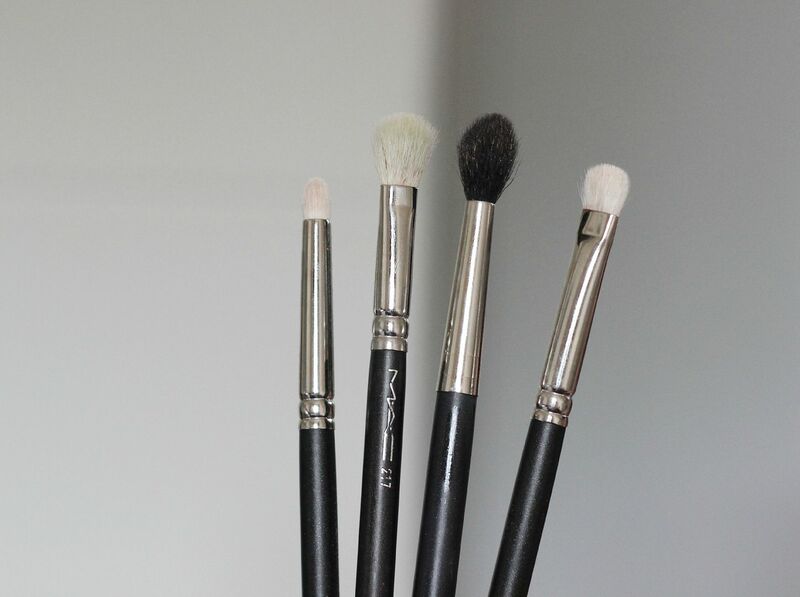 My four essential brushes are all from MAC – sorry! – but you can get eBay dupes for 99p for all of them(I’ve tried the 217 dupe and it’s pretty good). The 217 – ah, the eye brush that everyone seems to have. I have 4. I know, I’m actually a terrible person. They just seem to get dirty so quickly because I use one every time I wear shadow. If you want to wash a colour all over the lid, do some fancy crease work, blend out the edges or even to blend in your concealer… the 217 is your guy. Seriously, such a useful brush. The 219 – a teeny tiny pencil brush that is the only one you will ever need for smudging eyeshadow under your lower lash line. Can also be used for fancy cut-crease work. Ooh la la. The 239 – a flat little spade. If you want to seriously pack on the colour all over your lid, this is the one. Works just as well with creams and powders. I have 2. The 224 has been a game changer. I meant to pick it up for the longest time, and then I did and wow. Ok, this one is the one for making it looks like you’ve spent loads of time blending 1000 different shadows and making it look all professional. It diffuses the colour so nicely, especially when you hold the very tip and use it lightly. Amazing. Has replaced my 217 for the majority of crease work. So, my typical routine is packing far too much shadow all over the lid with the 239, before blending the edges with the 217. Then, when it looks bronzed enough, I use the 224 in the crease with something matte and aiming just above my eye socket sweep the colour back and forth like a windscreen wiper, concentrating the darkest amount on the outer corners. Then with a bit of the matte colour I work it into my lower lash line and sort of smudge everything a bit. There. What’s your favourite eye brush?